Central Committee approves proposal according to which committee will choose party chairman, woman for third spot on Knesset list. 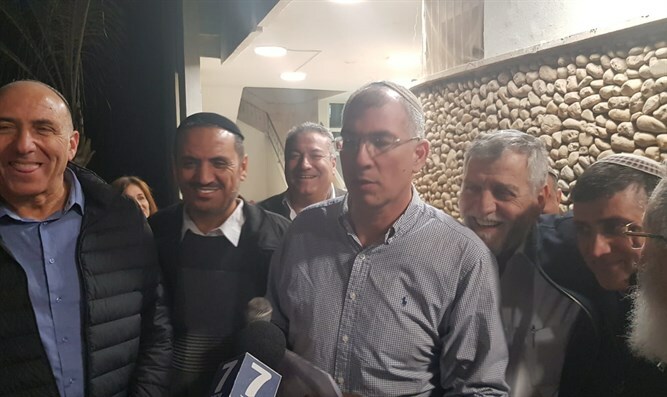 The Jewish Home Central Committee, which convened on Sunday evening, accepted a proposal according to which a steering committee will choose the chairperson of the party’s Knesset list as well as the woman who will be placed in the third spot on the list. It was also confirmed that the remainder of the list for the next Knesset would be chosen by the Central Committee. 359 of the members supported the proposal and 144 voted for a different proposal that was not accepted. The conference organizers said that more than 500 people participated in the conference, compared to 350 who participated in the previous vote on a compromise proposal led by religious Zionist rabbis, which did not receive the required majority required by the constitution. The public committee will convene on Monday to begin its work. Jewish Home Director General Nir Orbach expressed his satisfaction with the results, saying, "The Jewish Home is alive and well. I thank the hundreds of members of the Central Committee members who came this evening and voted for a resolution that will benefit religious Zionism in general and the Jewish Home in particular. We have a great deal of work to do and I call on all those who care about the Jewish Home to join and assist so that the Jewish Home will be a decisive factor in the Knesset and in the next government." Deputy Minister of Defense Rabbi Eli Ben-Dahan said after the vote that "the members of the Central Committee have spoken with overwhelming majority. I am pleased that a decision favoring the party and benefitting religious Zionism was made. This is the time to congratulate my friend, Director General Nir Orbach, who led a democratic process and with the participation of the party's Knesset members." "It is time to look ahead and choose a list that will stabilize and strengthen religious Zionism in the run-up to the upcoming elections. From here we embark on a new road, and we will work together for natural connections in order to unite the ranks and bring back religious Zionism’s power in the country’s leadership," added Rabbi Ben-Dahan. MK Motti Yogev said that "the challenge we face, members of the Jewish Home and religious Zionism, is clear. We have to choose a chairman for the party, after which we will select the best candidates who represent the religious Zionist public in all its variants, a team that will bring the most votes in the upcoming general elections." "In the end, it is only the Jewish Home emissaries, the ministers and the Knesset members who live the religious Zionist idea and are committed to strengthening our influence on all aspects of life in Israel. There will be someone to elect, who will do good for Israel, good for religious Zionism," added Yogev. Hagit Moshe, the deputy mayor of Jerusalem on behalf of the Jewish Home, told Arutz Sheva, "I supported the proposal. The big victory is in the number of participants from all over the country. It's not easy to come here from the north and the south. The party is vibrant, people came and expressed their views in the most democratic way. From here we move forward."